The New Guardian Energy Egg from our Energy Doc has massively boosted protection against WIFI, mobile phone, television and so-called Smart Meter stresses that are creating havoc in our human energetic systems. This 21st Century environmental stress affects some individuals more than others, but here's the goods on how and why we all need a Guardian! We've received a huge amount of feedback, over the years, about people's experiences of using the Guardian Energy Egg (the two comments on the right are about its use for symptoms triggered by watching television). I've been wanting to give you feedback on the Energy Egg I carry around with me. It's great! A couple of weeks ago, I showered but then forgot to put it back on me I was sitting watching TV, when I became aware that I was exhausted then I realized I was without my Energy Egg. I couldn't get my head right until the next morning; it was horrible. So, needless to say, I am . . . appreciating it daily. Tuesday evening, I sat and watched television for about an hour: the first time for weeks no problem, no sweating, nothing; it was great. Wednesday evening, I forgot about the Energy Egg; after about 10 minutes I had to go out of the room — the sweat was pouring off me. 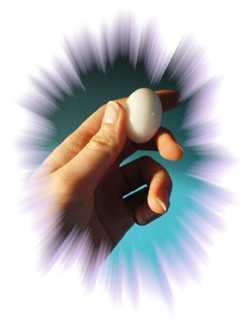 So from now on I'll carry the Energy Egg in my pocket. The kind of energetic damage from electronic equipment that causes extreme sweating, disorientation, fatigue or dizziness, is called a 6th chakra fracture because it's a tiny break or tear in the surface of that energy organ, at the center of your forehead. The 6th chakra controls the frontal lobes of the brain and the autonomic nervous system. 6th chakra damage can also manifest as insomnia, depression, anxiety, headaches, skin problems, relationship problems, allergies or sudden changes of mood. To anyone with a scientific background, this may sound like gobbledygook. Science doesn't (yet) have instruments that can measure chakras or the human energy field, so the idea that they control physical systems, or even exist, is commonly deemed nonsensical. But, in reality, an inability to measure a phenomenon doesn't necessarily mean it doesn't exist—it may just mean you can't measure it—and this simple observation is why we have had so much success with the Guardian Energy Egg. Environmental stresses—harmful environmental energies—are constantly entering our energy field. But usually, rather than causing damage, they are rapidly grounded out not unlike the grounding out of lightning via a lightning pole on a building. The body has its own energetic 'immune system'. It works by automatically emitting signals (specific energies) from your 7th chakra—located in the same space as the top half of your head—in response to incoming stresses. 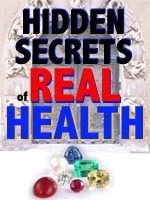 These signals bind with the environmental stress and carry it out of your energy body. However, no process is 100 percent efficient, so some environmental stresses aren't fully eliminated, particularly some of the more noxious modern-day stresses such as pulsed microwave fields (e.g. WIFI). These stresses then remain stuck in your energy field where they displace some of your own life energy, which thus becomes unavailable to you and your life. The more your energy field lacks the qi [energy] it needs to function effectively, the more you experience problems, of one kind or another, in your health, work, relationships, security, creativity, learning ability, or other affected areas of your life. The primary reason increasing numbers of people suffer from chronic health (and life) issues is the lack of energy available to their 7th chakra. This problem will only grow as the onslaught of new sources of environmental stress, such as Wifi, Smart Meters, mobile phone masts, DECT phones, etc. (that directly target the 6th and 7th chakras and thus the entire nervous system) increases. Unfortunately, the march of science has profoundly outstripped man's awareness of the consequences of his actions. By providing your 7th chakra with a reservoir of qi that is automatically available on demand, the Guardian Energy Egg may make a crucial difference to your ability to manage the environmental stresses to which you're being exposed from one day to the next. This simple, all natural, health companion works together with your own energetic immune system to continuously eliminate electro-magnetic pollution from your energy body and energy field, without side-effects. In the mid-80's, we realized that rather than continuing the vast and complex project of trying to analyze and define all the various kinds of environmental stress that influence human life or well-being, we needed to change direction. So, instead of continuing to catalog environmental stress, we started focusing directly on the human energy body itself, how exactly it is affected by environmental stress and how best to remove that stress. This change of orientation meant that once we had identified the damage being done to a client's energy body by an environmental stress, we could arrive at an effective solution without laboriously analyzing the stress itself. Science will eventually have means of examining chakras and quantifying many currently 'invisible' stresses. In the meantime, we can help many people who haven't been helped by methods that depend on current scientific knowledge. One example of this approach was described in Gas Pipe Blues; another in A Dog's Tale, and, again, in A Pain In The Neck. Over the years, we've seen thousands of people recover from chronic symptoms or diseases as a direct consequence of using this approach, including eliminating 'Television stress'. We have successfully applied these laws to numerous challenges being experienced by many kinds of people (and animals). We have used one kind of energetic device or another since the 80's to eliminate environmental stress from the human energy body. The Guardian Energy Egg is the latest development in this research. The rest of this article focuses on how the Guardian Energy Egg is designed to respond to contractions of the energy field. The light resonator—an instrument that generates concentrated forms of qi found in natural light—is an energetic charging device designed to input resonances into all of the Energy Eggs made by Energize Your Life. Its forerunner was used by practitioners in the 80's to manufacture homeopathic remedies—and is still being used by at least one homeopathic medicine manufacturing company. When its development program outstripped our ability to train and update practitioners to operate it adequately, we took it off the market. 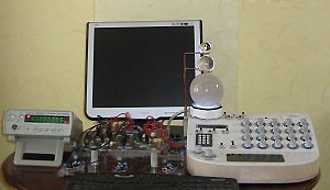 Since then the Light Resonator has continued to evolve as a lab bench instrument (see photo). In 2002, it primary use became that of an Energy Egg charging instrument. Unless an Energy Egg has been charged by the Light Resonator, it's just a stone egg. The signal the egg emits after it has been charged, is what makes it an Energy Egg. The reason the Guardian Energy Egg is an ovoid with equal dimensions at both ends (as opposed to a 'chicken egg') is that it's modeled on the shape of the human energy field, which is an ovoid extending up above your head and down beneath your feet. This shape is necessary to fully transmit the Guardian Energy Egg signal to wherever it's needed by your energy field. Means of using the Guardian Angel, Wealth Angel and Loving Relationships Angel—i.e. 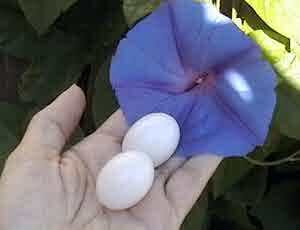 large Area Energy Eggs—to cultivate your higher awareness and receptivity to their respective forms of qi health, wealth and partnership in your life. Like traditional shivalinga, the Energy Angels can be used as a potent means of focusing your awareness on the areas of your energy body and life where empowerment—the reception of life-transforming energy—has become both necessary and possible. Consequently, everyone needs increasingly efficient ways of protecting themselves and their energy from their environment. We are committed to, and shall continue to, develop the most effective, natural and side-effect free means (such as Energy Eggs) of enhancing the energy body's own, innate, stress-elimination processes. This way, you can avoid the all too common side-effects so often associated with 'energy protection' devices that stimulate the energy body with their own emissions of stressful energies. And safeguard your health from environmental stress as much as you possibly can. © Stephen & Lynda Kane, The Life Energy Development Partnership Ltd.